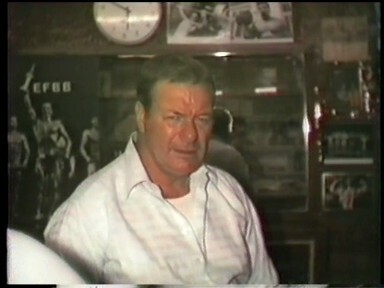 A TRIBUTE TO BILL STEVENS WHO RAN ONE OF THE MOST FAMOUS GYM IN ENGAND. Webpage layout by Stan of Stan's Gym Upminster as a memorial to BILL. Bill is greatly missed. Bill Stevens gym was up a long staircase. Bill used to start beginners in their training by getting them to run up and down his stairs. I remember it well. 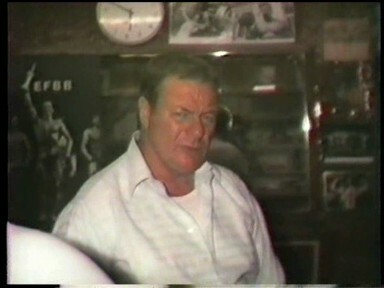 Back in 1980 when I first met Bill and trained in his gym we were soon to become friends. I say this but to be truthful, I guess Bill was a friend to everyone. Bill gave me great advise in how to run my own gym. 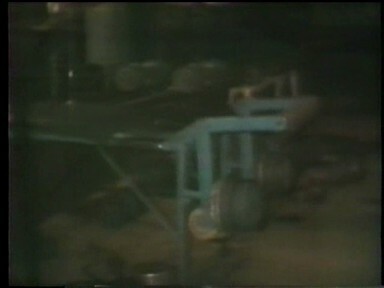 Stan's Gym. Bill was a great inspiration to a lot more people than I am sure he realized. bench more than 2501bs but trained very strict. Ah Bill may have said D.B fly's I am not sure. the world, I put it in my gym as my most proudest piece of equipment. To think of it. All the great physiques that had been built using it. 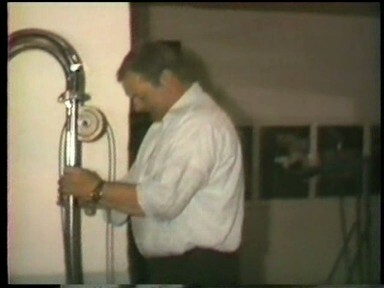 Bill used to sell me really cheap weights as well, he would bring them in his little van. 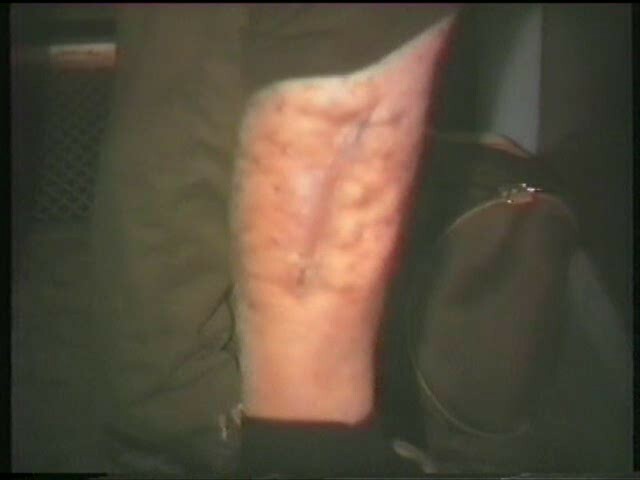 Ok this is the story I heard about how Bill's leg became filled with led as in the photo on the left. Bill and a friend was picking up some money from a bank in Stratford in 1982. Bill saw his friend come out of the bank before Bill had met him. 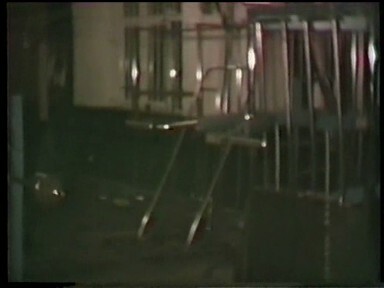 Three balaclava men attacked Bill's friend. 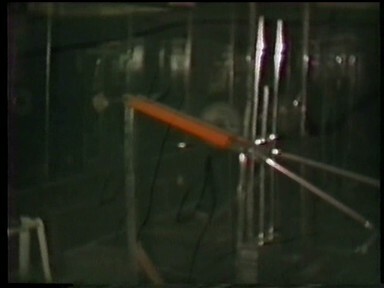 hear a big bang as the bank window shattered. 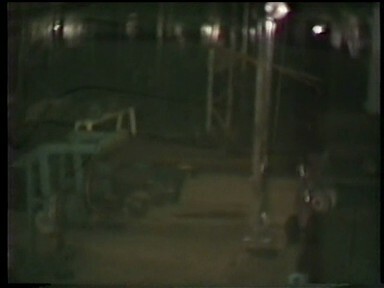 Bill had been shot at point blank range with a sawn off shot gun. The men didn't get the money because his friend was a very tough man who had hung onto the money with all his might. 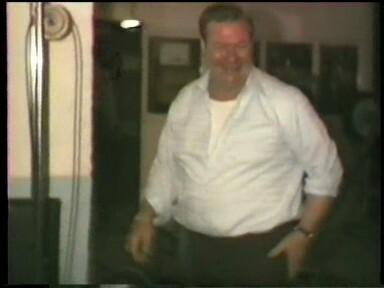 Bill was seen chasing the three robbers up the road beating them with his big thick weight training belt. Bill and his friend were all over the papers. 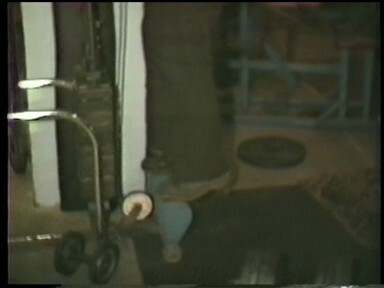 Bill was back training in his gym almost strait out of hospital as seen doing calf raises here on the right. Bill was certainly a tough man but everyone who knew him well also knew that he was a generous and very helpful man. Bill had a sign in his gym. "No fighting or you will go out through me". my friends telling them of what God could do and that Jesus had saved me, when someone in my gym told me that my old friend Bill had passed away. I was so sad that I hadn't seen him. I still miss him. My condolences to all his family and all who also miss him. 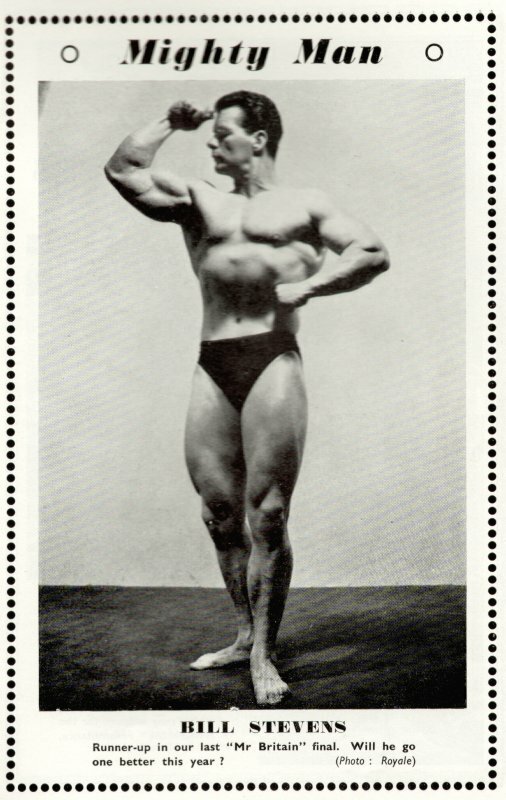 The first time I competed in a bodybuilding contest was at Bill Stevens’ Gym in Stratford, East London. 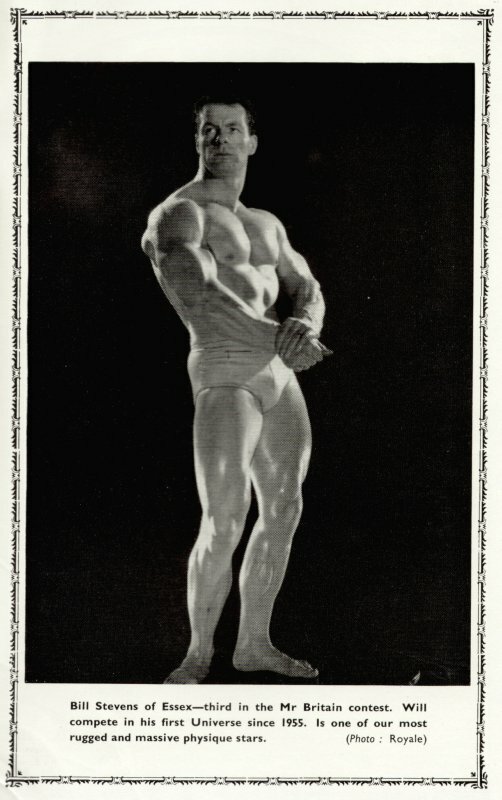 Bill Stevens used to hold an annual gym contest among his members, I entered, placed fifth and I was given a trophy (The trophy was very small). I can remember taking it and showing it to all my mates and they were all pleased for me. I think they had realised the significance of that trophy. Its was a bodybuilding trophy signifying that I was a muscleman and for me that was strange, for now I bore no resemblance with ‘the me’ that every one knew at school, if I had mentioned to anyone when I was at school that when I left I would be joining a gym and eventually I would enter a muscle contest they would have laughed me into an asylum! So for that reason me coming fifth in that show was a magical moment. "I trained at the gym from the age of about 15 in 1987. 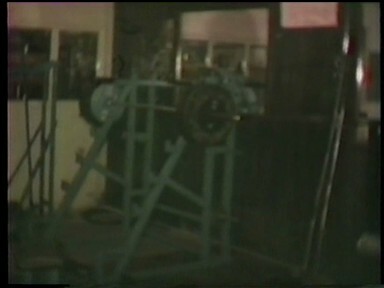 My dad, introduced me to the gym and I have many fond memories training there. It set me on my path to constantly strive through the hardships of training, through my career as a soldier in the Royal Green Jackets and later as an ultra endurance athlete. Many a time i'd be sitting on the business end of a 7.62mm accuracy international running through my stretches and muscle tensioning thinking about my time as a spotty teenager warming up by running up those long stairs...I remember them well!!! The gym had character, and many characters to make it a great atmosphere. Little Bill behind the counter, Elvis the Royal Marine, Lewy the old boy, and Wilf Sylvester, the man who nearly ripped every muscle in my body at the tender age of 16. I also remember the place with some sorrow too, as one of my old training buddies there, Pat Pasi, was murdered in 2001. 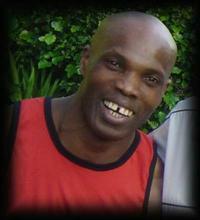 Pat was an accomplished martial artist, fighting and beating the champion Shaolin temple monk back in 1995." I think it would be fitting to have the old Tramway renamed 'Bill Stevens way'. I still talk to many people about Stratford and if i'm explaining when people can't picture the Tramway, I always put in "where old Bill Stevens gym was" and people remember. Take care and all the best with your gym. 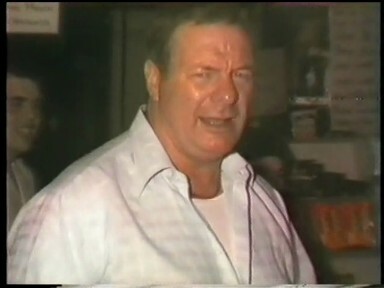 IN MANY PEOPLES OPPINION THE ROAD OUTSIDE HIS GYM OUGHT TO BE NAMED BILL STEVENS WAY. PERHAPS IF ENOUGH PEOPLE WROTE TO THE COUNCIL. WHAT DO YOU THINK ? THE COUNCIL WEB ADDRESS AND POSTAL ADDRESS HAS NOW BEEN SUPPLIED BY DENNIS FITZPATRICK IN THE ABOVE ARTICAL. SO DO WRITE TO THE COUNCIL AND PUT THIS FORWARD.